Reggae Divers Coron is the number one diving company in Coron , Palawan according to Google and Tripadvisor. 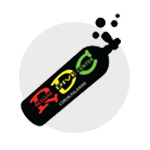 Being the only PADI registered Dive center in Coron , Reggae Divers is a must for people wishing to do the Open Water or the Advanced Open Water courses or any other course. Caution make sure you take your course only with a PADI registered Dive Center.